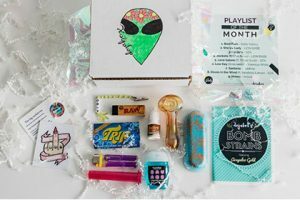 Stashbox is different from most of the weed subscription boxes on the market. It creates boxes that are personalized just for you, based on the preferences you state in your profile when you sign up. Not only that, but it allows you to get unique, artisanal glass and extras that you cannot get elsewhere. The boxes feature glass handblown by masters of the glassblowing art coming from China’s Hebei province, with pieces made of premium-quality China glass. Apart from the glass, you get a personalized selection of 5-8 lifestyle items, including accessories, body care, munchies, and other awesome goodies. Every box also contains a limited-series collectible Treemoji enamel pin. If you opt for a subscription, you pay $30 per monthly box. The shipping fee amounts to $6.95 for deliveries within the US and $15 for deliveries to Canada. 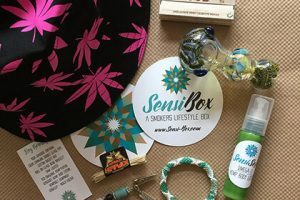 For customers who do not want to commit to a subscription before they try out the products, Stashbox offers the possibility to purchase a single box. The price is $35 per box, plus the shipping fee. You can also purchase extra items or incredible gifts in the Stashbox online store. You can choose from nearly 100 items and the prices start at only $1. Our ratings are the result of an objective and independent evaluation of Stashbox, generating the final rating that reflects the overall quality of the product. Ratings may change as the service changes. Stashbox user rating based on 3 user reviews. I ordered a stash box about a month ago, it hasn’t moved and it says “being built” has said that for a month. I haven’t seen it and I’ve tried to email them call them and text them no reply. Stash box is a terrible company and I believe nobody should order from them they’re awful. Im not sure how they got such a high rating but i never recieved my order and no answer from the mutiple times i have contacted them. I will not do business with them ever again. Im just hoping i can get my money back somehow cause i cant get any one from their company to answer me. Yeahhhhhh not too sure Stashbox should be rated so high this year. My name is Alex, I've been a member of Stashbox since early last year. Something about Stashbox has change since November/December. People are being charged for boxes and receiving nothing in return. I myself am still waiting for a CHRISTMAS STASHBOX. I have messaged the staff on numerous occasions (4-5 times) and they claim to answer within 48 hours, it's been a week and I still haven't received a reply. Do yourselves a favor and just go find a different subscription box, unless of course you want to pay for something that might never show up. We found 0 verified Stashbox promo codes for April, 2019. There’s no Stashbox coupons or discounts right now.